This is another blog posting that found its way to me in mysterious ways. 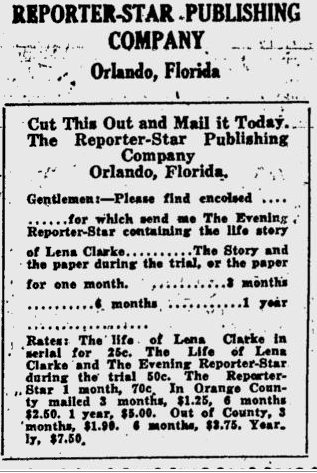 I was looking for information on the Clarke family that farmed the Lake Clarke area in the old Tropical Sun newspapers online. What I found instead was a story that belies belief. My timing in finding this story also showed it to be another Orlando Florida murder trial that ended as no one expected. 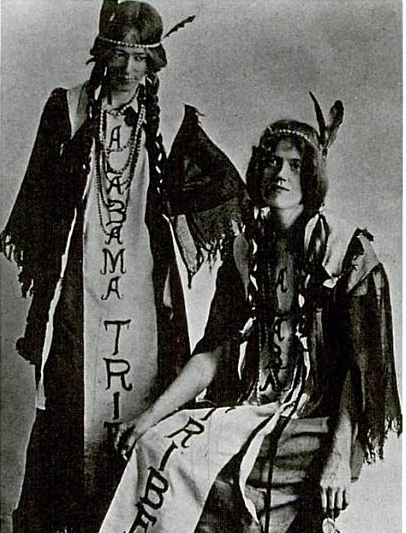 Lena Marietta Thankful Clarke was by all accounts an outstanding, intelligent young woman, born in 1886. Her father, the Rev. Almon Taylor Clarke was a minister, and Lena devoted much of her time to the Red Cross, the Congregational Church and selling War Bonds during World War I. Her sister Maude was the City Librarian for West Palm Beach, and the whole family had moved to West Palm Beach and lived on Poinsettia Street (later Dixie Highway). Lena seemed to be a very intelligent and precocious child, reportedly reading philosophy books at the age of 6, according to author Stuart McIver who told of this twisted tale in his book Murder in the Tropics. 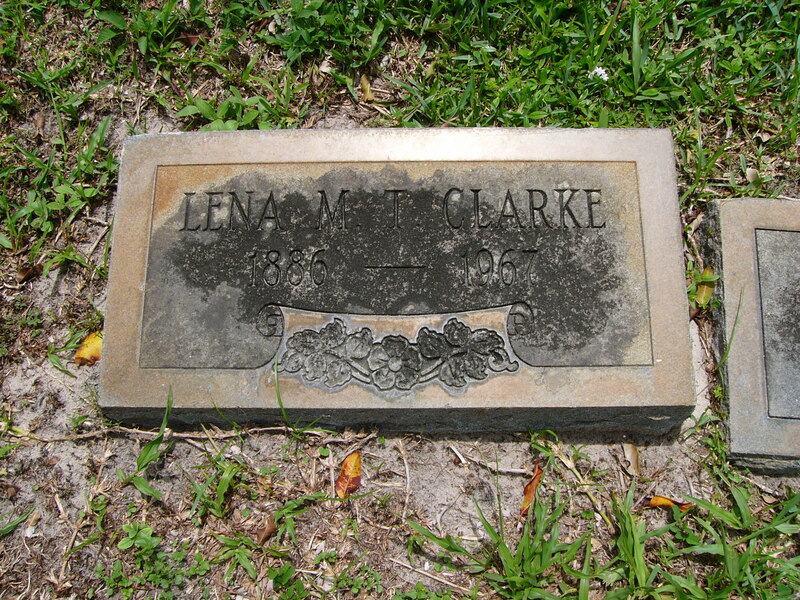 Lena had worked at the West Palm Beach post office for 10 years, where her brother John Paul Clarke had served as postmaster. He met a strange and untimely death on Christmas Day, 1920 when he died of a Coral snake bite. Paul was a taxidermist and snake charmer, and had left the post office in 1918. After the subsequent postmaster resigned, the postmaster’s job was open; Lena was named postmistress in 1920 with support of the community through a petition signed by local businessmen. Here is where the story begins to turn. Post offices took in quite a bit of cash beyond stamp sales and mailing parcels, mostly for money orders and war bonds. On July 26, 1921 she sent what was supposed to have been $32,000 in cash in two registered mail sacks to the Atlanta Federal Reserve Bank. When the sacks arrived, they were filled with mail order catalogs cut to the size of currency. A postal inspector arrived and questioned Lena about the theft. On Sunday, August 1, Lena hired a driver (Baxter Patterson) to take her to Orlando. There she checked into room 87 of the San Juan Hotel in downtown Orlando under an assumed name. She met up with a former mail carrier with whom she had worked, Fred Miltimore, who had left his post office job in West Palm Beach and was now running the Arcade restaurant in Orlando. claimed to have drugged him with a morphine pill. 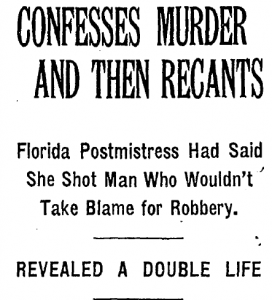 Vestal confirmed with West Palm Beach that she was indeed the postmistress. He sent officers out to the hotel, but they did not find a drugged Mr. Miltimore – they found a dead Mr. Miltimore, having been shot in the chest, with a gun lying nearby. With Lena still in his office, the officers relayed the information on Miltimore’s demise back to the chief. He immediately accused her of killing Miltimore. 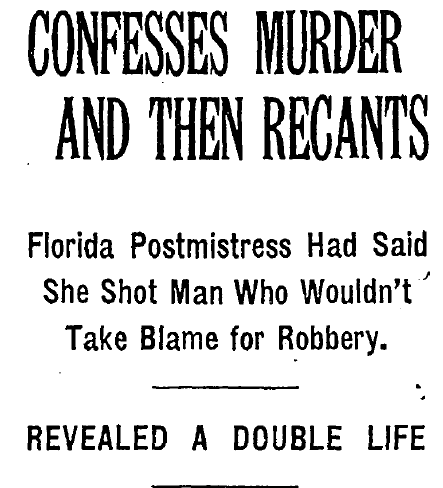 She initially denied it, but did confess that yes, she had shot him because Miltimore would blame the theft on her. Within days, she was indicted on charges of first degree murder in Orange County. Do you think I can meet, now, your soul’s sorest needs? To bring your mistakes to successes still. You look to my cunning to save you now. Weak fool of a woman, perhaps I will. Perhaps was too cruel of a word to say. Angels, blot from your records my prayers and my tears. Lest they hide them from God at the judgment day. As the trial approached, she once again changed her story about the money. Now she claimed that the money had really been stolen in 1918, and that another man, Joseph B. Elwell, had loaned her $20,000 to cover the theft. Except there was a problem – Elwell was dead! He had been shot dead in New York in 1920 in a murder that remains unsolved. The $32,000 was recovered among her belongings and bank accounts. Lena hired two law firms to defend her – an Orlando law firm and the West Palm Beach law firm of Chillingworth and Chillingworth. 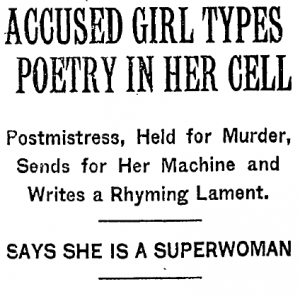 Both firms had settled on an insanity defense and Lena did much to support their case. She testified for several hours. Imagine this scene – gazing into the crystal ball she brought with her on the witness stand, telling of the twelve previous lives she had lived. She had lived in the Garden of Eden, had been the goddess Isis in Egypt, then Berenice, the last queen of the Jews, then King Herod’s wife, then she was eaten by lions. Now we jump forward many centuries and she is with William Shakespeare, and served as the role model for the Ophelia character. Throughout these scenes, she claims Miltimore was also there, and always persecuting her in various ways. She proclaimed that she would be found innocent and that this would be the start of her national career, serving as vice president of the United States and then president as the president (Eugene V. Debs, head of the socialist party) would be assissinated. 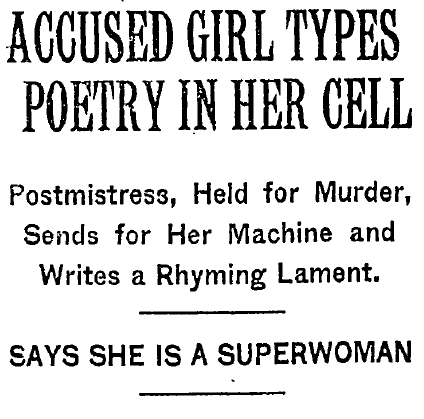 Several psychiatrists, or “alienists” as they were then called, testified as to her mental state. Two found her to be insane, while one thought the whole thing to be a clever ruse. The jury recessed and came back two and a half hours later with their verdict – not guilty by reason of insanity. The judge committed her to the Florida State Mental Hospital at Chattahoochee. She was not happy about that, proclaiming she would have rather been sent to the gallows. Alas, her stay was short at Chattahoochee, less than one year. She quietly returned to West Palm Beach and resumed her work with the church and the Red Cross. She lived in the house with her sister on Poinsettia Street, with neither woman ever marrying. The house, however, belonged to the Chillingworths; it was payment for their legal services. They trusted her enough to send her to England to research their family history. She shows up frequently in articles with her relief efforts through the 1940s and 1950s. 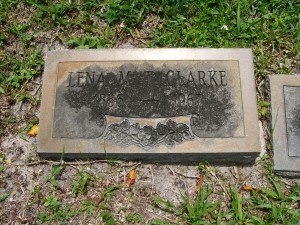 She died in 1967, and is buried in Woodlawn Cemetery in West Palm Beach. The echoes to an unexpected verdict from an Orange county jury after a short deliberation certainly brings to mind the Casey Anthony case. 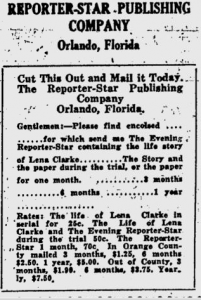 At the time, the Orlando Morning Sentinel relayed that more reporters were in town to cover the trial than at any other event that had occurred in Florida. That certainly can be said of the Anthony case as well. Was Lena crazy? Perhaps…crazy like a fox! This story was researched through the New York Times, the Tropical Sun and the Palm Beach Post archives, and the book by Stuart McIver, Murder in the Tropics.